Anna Gouriev-Pokrovsky is a gifted iconographer who has had the rare advantage of growing up in the household of one of the world's most prominent icon painters, Xenia (or Ksenia) Pokrovsky, her mother. Exposed to icon painting from earliest childhood days in Moscow, Anna was surrounded by the steady coming and going of artists, theologians and intellectuals. It was this close network of family and friends which was instrumental in recovering the ancient tradition of icon painting during a time when few understood it or dared practice it except in secret. In this stimulating environment, Anna learned icon painting in the gradual and natural way that daughters learn to cook by watching their mothers. It was also an education by discovery, involving the whole Pokrovsky family working together in various capacities to restore hundreds of icons brought to them from all over Russia. Much sought after as experts in icon restoration, they worked almost as archeologists and chemists to uncover, layer by layer, the lost technique and palette of generations of iconographers gone before. From the late 1960s and leading up to the fall of the Soviet Union, the Pokrovsky's ever-widening sphere of associates labored to build a foundation for the extraordinary rebirth of icon painting that is currently enjoyed throughout Russia. Eventually, this underground community of iconoraphers and theologians founded Izograph Society and openly declared their purposes. At the first Moscow celebration in 1989 of works produced by its members, Anna exhibited her icons. Deeply influenced by her mother's art, Anna expanded her proficiency in other mediums and earned a master's degree in tapestry design from the Applied and Industrial Art School of Moscow in 1990. 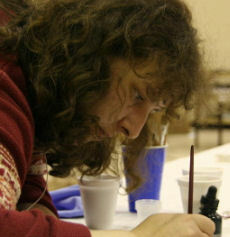 The Pokrovsky family came to the U.S. in 1991 and established a studio in Sharon, MA. Anna assists with her mother's commissions from monasteries and churches, including a major project for St. Andrew Orthodox Church in Lexington, Ky., which Anna co-authored. The mother-daughter team also trains hundreds of students who benefit from their wealth of accumulated knowledge and experience. As in Russia, the Pokrovsky studio in America has become a magnet for iconographers and scholars drawn from many parts of the world. As Anna's reputation as an accomplished iconographer has grown, she receives many commissions of her own. Home-school teacher of three daughters, Anna also finds time to teach the Six Days of Creation workshops, where she is recognized as an expert in the technique of assiste and gilding. Husband, Victor Gouriev, produces boards for the workshops and for the numerous iconic subjects commissioned from Anna and celebrated mother.